Ever wondered why there hasn’t yet been a children’s film about babies that are actually managers and wear tiny suits, whilst hoping to climb up the ranks to get provided with the greatest office space of all time? I’ve gotta admit that it’s not something that’s been at the forefront of my mind (or anyone else’s that I can think of), yet Dreamworks Animation have gone ahead and given it to us anyway. Tim is a 7-year-old boy who loves being an only child, as it means he gets loads of time with his parents each day. Their family is very tight-knit, until one day Tim meets his newborn baby brother for the first time, who isn’t quite what he was expecting. Meet the Boss Baby – a tiny, suit-wearing corporate who carries a briefcase and is fully able to talk (but only does so when there aren’t adults around). As it turns out babies all come from BabyCorp, a fast-paced baby-making business somewhere inaccessible for regular people. Most babies are destined to become part of a family, yet a small selection of babies make it to management instead. This is what happened to Boss Baby, and so he’s actually on a secret mission to discover and eradicate a threat so big it’s promising to wipe out the idea of babies altogether… a new type of puppy. Sounds bizarre, right? Well, you’re right if you agree. It’s overly complicated and confusing from the beginning – abstract can be good but I felt this was a bit too leftfield for it to make much sense. I’m not saying it doesn’t work, because it does, but it just isn’t as strong as other plots that have graced our screens recently, such as the slightly similar ‘Storks’, which was both hilarious and ingenious. The other issue with the plot was that the potential threat of babies being pushed to one side in favour of fluffy puppies isn’t explored enough despite being the main part of the story – it was hard to really vie for Tim and Boss Baby as the consequences of such a thing happening weren’t really explained transparently enough. It’s easy enough for an adult to make the necessary connections but for some kids the plot might become just a side focus of the film at this point. It is still a good film though, despite this – Tim is a highly likable and relatable main character, especially for kids who have younger siblings and may feel somewhat forgotten about. Boss Baby is also a great character who adults may be able to relate to more, and reminds me slightly of Stewie from ‘Family Guy’ (minus the expletives and the inappropriateness, of course). My favourite aspect of the film was the clever comparisons between reality and Tim’s imagination – there was a bit of unreliable narrator thrown in, as well as a lot of surreal that provides some great visual imagery. The humour is generally quite funny for all ages although I felt that a lot of the business references would go over kids’ heads – good for adults watching, yet it may detract from the humour for younger watchers. 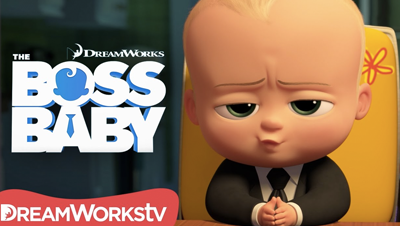 Interestingly, the big emotional pull that we’ve become used to expecting from Dreamworks and Pixar wasn’t quite there with ‘Boss Baby’, but then that does make quite a nice change for those of us that just want something light-hearted and less focused on teaching an important lesson to the kids. I’ll admit that I didn’t think ‘Boss Baby’ was going to be that good after watching the initial trailer, but luckily the film proved me wrong. Sure, it’s not going to be film of the year, but it’s still a good watch that both children and adults will enjoy.